A traditional root crop long neglected by modern science could be the best bet for farmers in Sub-Saharan Africa to beat climate change, according to a new study by a team of climate scientists. The research, published in a special edition of the scientific journal Tropical Plant Biology has found that the rugged root crop cassava will brush off expected temperature rises of up to 2 degrees Celsius in the region by 2030 – and could be even more productive thanks to climate change. Originally from South America, cassava was first introduced to Sub-Saharan Africa by Portuguese traders in the 17th Century. Now it is the 2nd most important source of carbohydrate in the region, where it is consumed by around 500 million people every day. Despite being able to produce its starch-rich roots in poor soils and with little water, making it a reliable crop in difficult environments, investment in cassava research has been dwarfed by decades of research into better-known staples like rice, wheat and maize. Using a combination of 24 climate prediction and crop suitability models, scientists from CIAT and the CGIAR’s Climate Change Agriculture and Food Security Research Program (CCAFS) compared the expected impacts of climate change on the production of cassava and six other key staple crops in sub-Saharan Africa – potato, maize, bean, banana, millet, and sorghum. 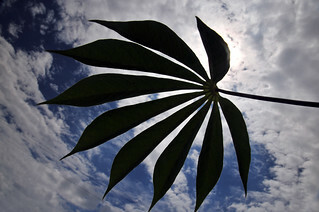 They found that by 2030, temperature rises of between 1.2 and 2 degrees Celsius, combined with changes in rainfall patterns, will leave cassava in a class of its own, outperforming the other crops overall. In East Africa, for example, it bucks the trend of declining suitability of all other crops in the study, with a 10% increase. In West Africa cassava will hold its ground, significantly outperforming the suitability of potato (-15%), bean (-20%) and banana (-13%). Cassava, along with banana and maize, will see a 5% increase in suitability in Southern Africa, with only Central Africa registering decrease in cassava suitability (–1%) – significantly better than the substantial declines expected in potato and bean. “Cassava is a survivor; it’s like the Rambo of the food crops,” said CIAT climate scientist and the report’s lead author, Andy Jarvis. “It deals with almost anything the climate throws at it. It thrives in high temperatures, and if drought hits it simply shuts down until the rains come again. There’s no other staple out there with this level of toughness. According to the report, there is still room for crop improvement efforts to maximise the potential of cassava. For example, breeding to improve drought and cold tolerance could support the expansion of cassava production into drier areas of Sub-Saharan Africa, and cooler parts of Southern Africa. The report also stresses the importance of more research to help make cassava production more resilient to pests and disease outbreaks, such as whitefly, mealybug, cassava brown-streak disease and cassava mosaic disease, to reduce existing threats and prepare for emerging ones. “Tackling cassava’s vulnerability to pests and diseases could be the final hurdle to a food secure future for millions of people,” continued Jarvis. “If we’re well prepared for these threats, cassava could be one of the most climate change-resilient crops an African farmer can plant. “We’ve been waiting a long time for some good news about food security and climate change in Sub-Saharan Africa. Finally, I think it’s arrived. While the other staples will struggle in the face of climate change, it looks as though cassava is going to thoroughly enjoy it. 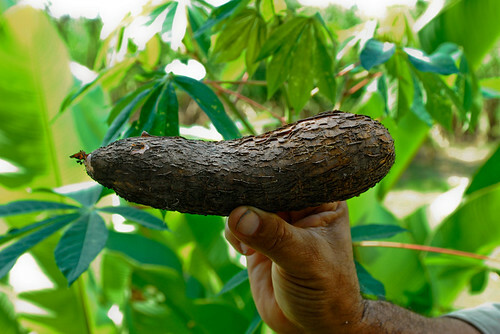 Read the full report, Is cassava the answer to African climate change adaptation?, by Andy Jarvis, Julian Ramirez-Villegas, Beatriz Vanessa Herrera Campo and Carlos Navarro-Racines, here.